Since the Deepwater Horizon Oil Rig exploded in 2010, BP has made a lot of big talk about their commitment to the Gulf. They paint themselves as suffering martyrs trying to protect the Gulf from an unavoidable disaster, or, even worse, as heroes who have come in to bear the burden of fixing a disaster caused by others. But, let’s not forget what they did to earn this responsibility. The BP Oil Spill is the largest oil spill in US History. During the 87 days of the spill, over 200 million gallons of crude oil flooded into the Gulf of Mexico. Over 16, 000 miles of coastline was affected by the spill. And even though the well was capped in 2010, oil continues to wash up on the shores of Texas, Louisiana, Mississippi, Alabama, and Florida. Between the Deepwater Horizon explosion and the Texas City Refinery explosion, BP has been directly responsible for 26 deaths in the Gulf States over the past decade. Additionally, 17 people were injured in the Deepwater Horizon explosion and over 175 people were injured at the Texas City Refinery Explosion. BP chose to use the dispersant Corexit during the clean-up, over more efficient and less harmful alternatives as a cost saving measure. The use of Corexit is banned in the Europe due to its harmful effects. To date, residents of the coast and clean-up workers continue to report respiratory problems and skin rashes. Furthermore, the use of Corexit merely caused the oil to sink. It did not help remove the oil from the water, it only helped remove the oil from the sight of residents and, more importantly, news cameras. Since the explosion and spill, BP plead guilty to 11 Felonies related to the DWH explosion, including manslaughter. In the same plea, BP also admitted guilt in two misdemeanors and one felony count of obstruction of justice. While this is particularly alarming, it should be noted that by pleading guilty, BP was able to immunize itself from additional criminal charges resulting from the spill. One can only speculate how many charges would have surfaced if BP had plead innocent and investigations had continued. Nearly 4 years after the spill, over 100,000 victims and businesses remain unpaid for damages suffered as a result of the spill. Between the inefficiency of the Gulf Coast Claims Facility and the complexities of the Deepwater Horizon Settlement, thousands of legitimate claims were either wrongfully denied or simply fell through the cracks into a paperwork nightmare. This is a far cry from the speed recovery that was promised by BP and Kenneth Feinberg, the attorney who managed the GCCF, who promised at that start of the program that individual claimants would receive payment in 48 hours and businesses within one week. BP’s commitment to the Gulf is not due to some high minded sense of dedication. It is the result of BP being forced to reconcile their flagrant disrespect and criminal negligence towards both personal and environmental safety. And, despite all of this, BP’s profits continue to grow. But, there is still hope. 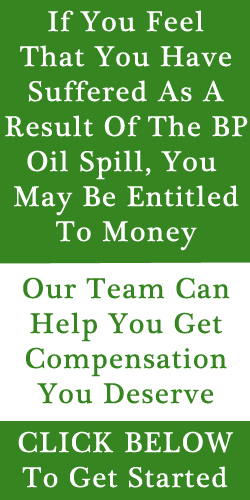 If you have suffered as a result of the BP Oil Spill, there are still actions that you can take to get the compensation you deserve. Fill out the contact form on this website or call 1-877-272-3224. Our teams of attorneys and accountants will help you get the money you are due. It’s not too late to make BP pay.